Amal El-Mohtar is a Canadian poet and writer of speculative fiction. She has published short fiction, poetry, essays and reviews, and has edited the fantastic poetry quarterly magazine Goblin Fruit since 2006. Beginning in February 2018, she reviews science fiction and fantasy books for the New York Times Book Review. She lives in Ottawa, Ontario where she has worked as a creative writing instructor at Carleton University and the University of Ottawa. Other awards her short fiction has been nominated for include the 2010 Nebula Award (for "The Green Book"); the 2016 Nebula Award (for "Madeleine"); the 2016 World Fantasy Award (for "Pockets"); and the 2017 World Fantasy Award (for "Seasons of Glass and Iron"). ^ a b c Blackmore, Olivia (15 August 2017). "Ottawa writer's 'fairy-tale mashup' wins prestigious Hugo Award for science-fiction". Ottawa Citizen. Retrieved 5 February 2018. ^ McDermott, J. M. (November 2011). "Nebula Awards Interview: Amal El-Mohtar". Retrieved 28 June 2015. ^ El-Mohtar, Amal (25 October 2013). "Interview: Amal El-Mohtar". Amazing Stories (Interview). Interviewed by Diane Severson Mori. Retrieved 20 October 2015. ^ "Amal El-Mohtar Replaces N.K. Jemisin as The New York Times Book Review's Otherworldly Columnist". Tor.com. 29 January 2018. Retrieved 29 January 2018. ^ "SFPA Rhysling Award Archive". Archived from the original on 29 August 2015. Retrieved 28 June 2015. ^ "2015 Locus Awards Winners". Locus. 27 June 2015. Retrieved 28 June 2015. ^ "Announcing the 2016 Nebula Awards Winners". Tor.com. 21 May 2017. Retrieved 21 May 2017. ^ "2015 Locus Awards Winners". Locus. 27 June 2017. Retrieved 27 June 2017. ^ "2017 Hugo Awards". The Hugo Awards. Retrieved 11 August 2017. ^ "SFWA announces the 2010 Nebula Award Nominees". 22 February 2011. Retrieved 28 June 2015. ^ "Nebula Awards". SFWA. Retrieved 18 June 2016. ^ "World Fantasy Awards 2016". Science Fiction Awards Database. Locus Science Fiction Foundation. Retrieved 15 July 2016. ^ "Nominees". World Fantasy Convention. Retrieved 7 September 2017. 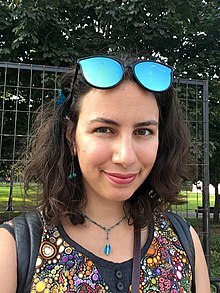 Wikimedia Commons has media related to Amal El-Mohtar.